Latino/a literature is one of the fastest developing fields in the discipline of literary studies. It represents an identity that is characterized by fluidity and diversity, often explored through divisions formed by language, race, gender, sexuality, and immigration. 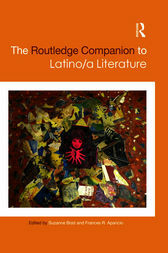 The Routledge Companion to Latino/a Literature presents over forty essays by leading and emerging international scholars of Latino/a literature and analyses: Regional, cultural and sexual identities in Latino/a literature Worldviews and traditions of Latino/a cultural creation Latino/a literature in different international contexts The impact of differing literary forms of Latino/a literature The politics of canon formation in Latino/a literature. This collection provides a map of the critical issues central to the discipline, as well as uncovering new perspectives and new directions for the development of the field. It is essential reading for anyone interested in the past, present and future of this literary culture.